A blender delight made from yogurt, fruit and milk. Try the variations! 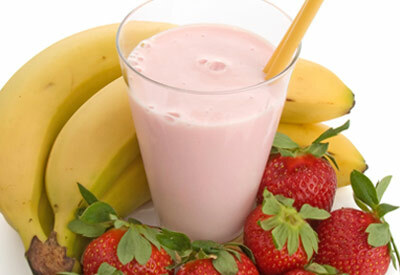 Place bananas and strawberries into the blender container. Add milk and yogurt; cover and blend. Instead of the yogurt and milk, add 1/2 cup apple juice, 1 cup crushed ice and 1 tablespoon honey. Reduce milk to 1/2 cup and substitute 1/2 cup vanilla ice cream for the yogurt. Then add a handful of crushed ice and a small bag of M&M candies.